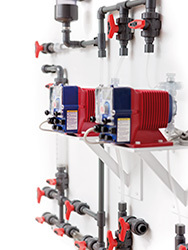 A panel consists of one or more dosing pumps, associated piping with valves and optionally flowmeter. The entire system is delivered together on a wall mounted panel. IWAKI specializes in customized dosing panels. The panels are used in connection with addition of polymers to wastewater, dosing in cip plants in the food industry and water quality control in swimming pools. Our panel solutions are designed to withstand the most severe operating conditions, such as temperature and liquid type.